To snooze your Droid X phone, press and release the Power button. No matter what you’re doing, the phone’s display turns off. The phone itself isn’t off, but the touchscreen display is dark. The phone enters a low-power state to save battery life. Snoozing doesn’t turn off your Droid X; you can still receive calls while it’s asleep. The phone wakes itself when it receives a call. 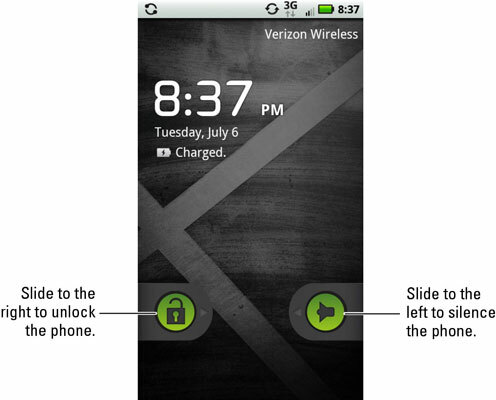 The unlock screen appears, though information about the caller appears on the touchscreen: Slide the unlock tab to the right to unlock and answer the phone. You can snooze the phone while you’re making a call. Simply press and release the Power button. The phone stays connected, but the display is turned off. But you don’t really need to manually snooze your Droid X because it has a built-in timeout: After a period of inactivity, or boredom, the phone snoozes itself automatically — just like Uncle Bob after Thanksgiving dinner. While viewing the Home screen, press the Menu soft button. Choose Settings, then Display from the menu that appears. If your Droid X hasn’t yet been updated to the Android 2.2 operating system, choose the Sound & Display item instead. Select Screen Timeout from the list that appears. You need to scroll down the list a bit to find this option. Choose a timeout value from the list provided. The default value is 1 minute. When you don’t touch the screen or use the phone for a while, the sleep timer starts ticking. About ten seconds before the timeout value you set, the touchscreen dims. Then it goes to sleep. If you touch the screen before then, the sleep timer is reset. When the Droid X is playing music, which it can do while it’s sleeping, information about the song appears on the unlocking screen. Controls to play and pause and to skip to the next or previous song appear.